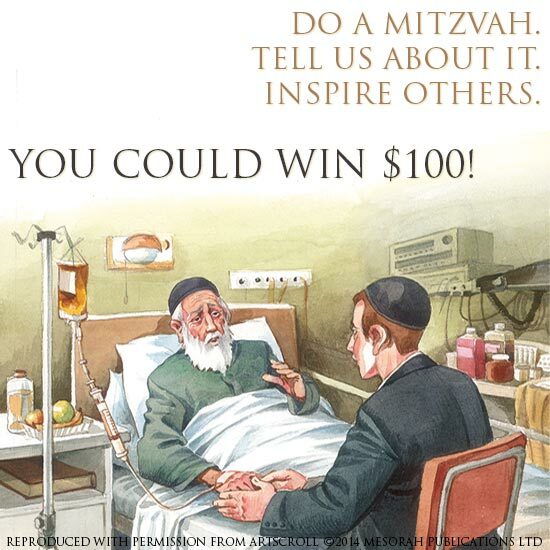 Do a Mitzvah and You Could Win $100! What better time of year is there to focus on doing mitzvos bein adam lechaveiro, good deeds between man and his friend, than during the three weeks and leading up to Tisha B’av? Our sages teach us that the Bais HaMikdash, our holy Temple, was destroyed due to baseless hatred between Jews. Thus, these three weeks of mourning the destruction of the Bais HaMikdash are an excellent time to bridge the gap between fellow Jews by going out of your way to do good deeds for another person. Sometimes an action which only takes a minute or two of your time can make a person’s day. Stop and think to yourself. What can you do to make someone else’s life better? How can you improve the life of your friend? What do you have to give that could be of service to another person? Everyone has something they can do or something they can give, that will help bring the Beis HaMikdash closer. So make your mitzvos a priority this week, and then come back and tell us about it. While the reward you get for doing a mitzvah is definitely enough of an incentive, we want to hear about your good deeds so that it can inspire others to do more mitzvos as well. 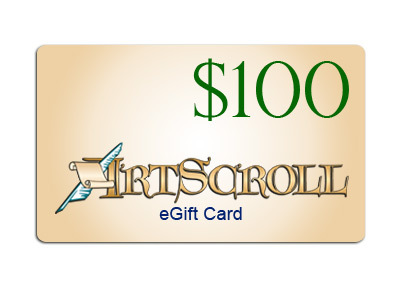 One of our readers will get an extra reward: a $100 eGift Card to ArtScroll.com! Comment on this post telling us: What mitzvah (good deed) have you done for another person? You can enter daily for extra chances to win! **Giveaway ends on Sunday, July 27th at 11:59 pm eastern time. Winner will receive a $100 eGift Card to spend at ArtScroll.com. Prize will be sent via email. Winner will be notified via email and will have 48 hours to respond or another winner will be chosen. Valid email address must be provided to claim prize. Limit one entry per day per person. I resolved to start smiling more to keep people cheerful. With the situation now in Israel, people need cheering up. I visited a friend with cancer. We enjoy spending time together. B’ezras Hashem there will be many more opportunities. being nice to my kids! We’ve taken over the kids congregation at synagogue. I’m constantly trying to think of new ways to get new kids into the service. Flyers, websites and talking to the day school to get more kids involved in Judaism. I saw my next-door-neighbor very depressed, so I brought him a bunch of flowers and chocolates and it seemed to really cheer him up. Gave up a table at a restaurant to two elderly women. I offered for my friend to come over and do her laundry by us, feed her supper, and give her a ride home. I visited a nursing home. Said “Hi, how was your day?” to a stranger (who was a lower-class worker) and he was really grateful. Had a friend sleep over last minute and gave her a ride early in the morning. I cleaned up a very very dirty house all before shabbos. I ‘ve signed up for the Shmirah project to pray for an Israeli soldier. I am a believing Gentile. I also serve the G-d of Avraham, Yitzak & Yachov. I have friends from Israel. I encourage them and tell them I’m praying for their families and loved one. A friend came over to borrow some books. I saw how tired she looked and invited her in with all her kids for supper and playtime. hosted guest for Shabbos. made bed and entertained her! I put on tefillins this morning. Spoke to a good friend about the laws of Lashon HaRa from Lesson a Day! We started learning together! I helped teach kiryah to a little boy with special needs today. It is a mitzvah to move to Eretz Yisrael. I am making Aliyah on August 26th. I encouraged a fellow Jew who was down, shared in their grief. I boosted someone’s spirits by giving them chizuk.